Difference between revisions of "Moira Orfei"
Moira Orfei (born Miranda Orfei, 1931-2015) was an Italian pop-culture icon. A member of Italy's most famous circus family, she could compete in fame with any Italian music or movie legend. She was undoubtedly the only circus owner in the world who could get away (for forty years, no less!) with advertising her circus using posters that prominently displayed only her head shot and her first name. 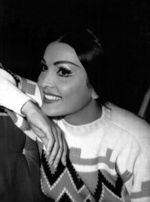 Much of her reputation was due to her long movie career, which coincided with the golden age of Italian cinema. But it was also due to the quality of her circus. The daughter of Riccardo Orfei and Violetta Arata, she was born in the family's living trailer on December 21, 1931 in Codriopo, Italy. As a child, Moira was trained in all the basic circus disciplines. In 1960—without ever leaving the circus—she began a movie career. Ultimately, she appeared in nearly forty films, including popular Italian comedies and a host of internationally successful Italian productions based on mythological themes, such as the Hercules, Ursus, and Samson series. In 1961, she married the acrobat Walter Nones (1934-2016), the son of Giuseppe Nones and Adele Medini. A year later, they formed a company with the Austrian Swoboda sisters (of the Medrano Swoboda circus) and began a long career as circus owners and directors. A year after that, the Orfeis and the Swobodas parted ways. Moira and Walter went on to create their own Circo Moira Orfei, which quickly drew attention, both for the elegance of its productions and its infrastructures and, above all, for the high quality of its acts. Moira and Walter launched the monumental Circo sul Ghiaccio ("Circus on Ice") in 1969. It was easily the most sophisticated circus-on-ice show ever undertaken; it had both a circus ring and a skating rink, and the show included elaborate set changes, a huge variety of costumes, and an international cast of circus and variety megastars. During this period, Moira's elephant presentations made her a legend, while Walter became an excellent lion and tiger trainer. In 1987, Walter and Moira produced the Moira + Mosca circus, which combined some of the best Soviet acts with Moira's Italian performers and animal acts. That same year, they produced a superb seventeen-tiger act with the help of the great trainer Jean Michon. The act was presented by Walter's brother, Massimiliano Nones, and became the first cage-act to win a Gold Clown at the International Circus Festival of Monte Carlo. Moira's sons, Stefano and Lara, also won a Silver Clown in Monte Carlo in 1999 with two acts: A double "haute-école(French) A display of equestrian dressage by a rider mounting a horse and leading it into classic moves and steps. (See also: High School)," and a display of exotic animals that included a "liberty"Liberty act", "Horses at liberty": Unmounted horses presented from the center of the ring by an equestrian directing his charges with his voice, body movements, and signals from a ''chambrière'' (French), or long whip." presentation of a giraffe, a rhinoceros, and antelopes with zebras. Moira retired from performing in the late 1990s, but she continued to supervise every detail of her organization. Neither did she entirely disappear from the ring: She continued to greet her audience at the opening of each performance, and her entrance in the ring always prompted standing ovations and flower-throwing. Her son, Stefano Orfei-Nones (b.1985) has continued the family tradition, and has become one of Europe's foremost animal trainers, while her daughter, Lara, became a talented equestrienneA female equestrian, or horse trainer, horse presenter, or acrobat on horseback.. In her later years, Moira had appeared in a few screen comedies and became a much sought-after guest on TV talk shows. She had become circus icon; she was even featured in a novel, Moira Orfei in Aigues-Mortes (2004), by Wayne Koestenbaum. With its large menagerie and classy productions, its fine orchestra and true corps-de-ballet—together with Moira's attention to detail and her booking some of the world's finest acts—Moira Orfei's circus was among the most successful in Europe. Moira Orfei passed away in her sleep in Brescia, in her living trailer, on November 15, 2015. She was in her eighty-fourth year. Her funeral was held in San Donà di Piave three days later; an estimated 5,000 persons watched the funeral cortege, with a hearse drawn by four white Lipizzaners carrying her coffin to the tune of a marching band playing circus music! To the Italian people Moira Orfei was a true Circus Queen. She had indeed a colorful and oversized personality, but she was also one of Europe's most respected circus owners.